The plan above left shows the division of allotments in a field called Hawley Hill situated to the south side of Lowdham Lane, the lane is positioned to the left on the plan. The field was divided into 84 strips which had 3 distinct widths. Adjacent cottages were known as ‘Club Houses’, the field is marked number 40 and both the cottages and field can be seen on the 1895 o.s. map above right. Much later, in times of great depression in the framework industry they were able to develop this into a second occupation of market gardening. In 1886 the rules and statement of benefits and fees charged from time to time were; members paid entrance fee of 5s. (shillings) and a monthly subscription of one shilling. Benefits were 7s. a week and £6 for a funeral. The Woodborough Society does not seem to have had any rituals or elaborate ceremonies at meetings as some affiliated societies did, apart from one of the rules which stated that "at the death of each member residing in Woodborough there shall be 13 members in rotation requested to accompany the corpse to the grave in solemn order". However the rules themselves were somewhat obscure - one hand-written entry says: "That no members receive no overpay but what he pays over and above 3 pounds and that he receives according to the time what he pays over and above the said 3 pounds as an amendment to the 19th article". There was one very important event in the Society's calendar - Feast Day. The Club Feast should not be confused with the village feast. Both were important social events, which involved the whole of the village, within living memory at least, but it was the Club Feast that attracted most attention. From the beginning, the Society celebrated its feast, and accounts for 1827 show expenditure on items such as mutton, cheese, lettuce, mustard, cabbage, bread, sugar and ale. A band played an important part in the celebrations, probably the village band. In 1831 £1. 4s.0d. was paid for its attendance. The Club rules declared 'A Feast shall be provided annually on Tuesday in Whitsun week. Every member was expected to be at the Clubroom by 9 o'clock, and from the Clubroom they walked to Divine service at Church or Chapel. Those who remember the annual event in the 1920's and 1930's recall more vividly the route round other village institutions. "We used to go down to Mr. Kelk's on Shelt Hill, the band leading Club members - to start about 11 o'clock, then we'd march up to the New Inn (on Shelt Hill) to play there, that was us first drink, then we got down to the Nags Head where we had nearly an hour, then up the main street to the Bell's (Four Bells Pub) for lunch, after we came out about 2.30 time up to Thorneywood (that is Thorneywood House on what is now known as Foxwood Lane), an hour there with dancing on the tennis courts, then back to the Hall and dancing on the bottom lawn. About five o'clock time we'd have a tune at Johnny Ball's shop, then on to the Manor, from there we'd march to the band room, we'd all be dead beat! It were a proper boozy affair!". So every Whit Tuesday they had a feast and up to 1856 they took the money for this out of the funds of the Society. In spite of the fact that they had not got very much money, on a number of occasions in the 1860's they spent £20 on the feast, and in the 1830's £10. On one occasion they were in debt, but the Society still survived. There is one apocryphal story - the same thing happened to it as did to other societies. In those days they had one defaulting treasurer and because they did not have to take, or did not have the practice of taking money to the bank, he kept it in a bag in golden sovereigns. When he was suddenly missing from the village he left the bag and the books behind, but the bag contained farthings instead of sovereigns. They were not particularly anxious to bring the police into this and decided to send two members to Liverpool. They found he had gone there en route to America and hoped to apprehend him, recover as much money as they could and then drown him in the Mersey. Their design was frustrated because two days before they arrived he had got on a boat and didn't return! In 1765 the population of Woodborough was about 200. By 1801 it had reached 527, but between that time and 1830 it had risen to 800, which means of course that something had happened which entirely changed the situation so far as the population of the village was concerned. The Reverend Walter Buckland in his 1896 book "The History of Woodborough" says: - "In 1844 there were 16382 frames (frame knitting machines) in this County of which Arnold had 1397, Calverton 409, Epperstone 30, Lowdham 94, Lambley 381, Oxton 56 and Woodborough 191, but the wages were very low. It is at that time, between 1800 and 1826 that the Woodborough Male Friendly Society came into existence." We know that a Friendly Society existed in Woodborough in 1803 with 71 members; by 1815 there were 115 members in the village. This probably failed, and the books of the Woodborough Male Friendly Society suggest that the Society began in 1826. Membership was not open to all; only healthy men under the age of 31 years could apply. The first members and subsequent members were largely, but not entirely of course, stockingers. The rule book governed the running, eligibility for membership, and matters such as rate of contributions and benefits, conditions for receiving sick pay, fines for various kinds of offences or omissions, and set out the circumstances whereby the ultimate sanction - exclusion from the Society - would be enforced. By the 1840's they had got the idea that because of the insecurity of the work of the stockingers, the long periods out of work and the short time and the low wages, that they should have something more so this Society set itself out to buy land to let off as allotments to its members. The first piece was purchased in 1841 with more between 1856 and 1862 making 16 acres that was let to its members. A lot of money was spent on draining and improving the land that was then divided into twelfths and eighths of an acre and it was intended that the members of the Society should have sufficient land on which to grow potatoes for the family and barley to feed a pig. The Society purchased various plots to be used as allotments. Later records show that in 1929 the value and acreage was as follows: - Roe Hill - four acres, New Lands on the north side of Lowdham Lane - eight acres, Hawley Hill on the south side of Lowdham Lane - twelve acres for a total value of £1,700. Because they did not work regular hours and were very often out of work or worked a few days a week, this brought about a revolution in the way of life of the people of the village because instead of being entirely dependent on the hand frame they had this other line. The Annual Dinner of the Woodborough Male Friendly Society was held on Whit-Tuesday. Proceedings commenced with a short service in Church at 11 a.m. when the Vicar preached on Proverbs XIV, 23, “In all labour there is profit.” The usual number sat down to dinner, which was followed by the usual loyal and complimentary toast. The secretary, Mr John Clayton, read a satisfactory balance sheet showing a balance on the right side. Membership of the Society declined from its peak in the 1880's of over 200, to 141 in 1926 and 99 in 1947. During these years of decline the village had changed. Population had fallen from 900 in the 1870's to 661 in 1931 and the pattern of employment changed with virtual disappearance of the framework knitting industry to its replacement by market gardening as the main occupation. The passing of the National Health Act in 1946 and continual development of the Welfare State meant that medical care and sickness benefits were provided by the State. Members felt the Society was no longer serving its former useful purpose and eventually decided to sell the land. The Society was dissolved on 8th March 1954 and its assets were divided amongst the 78 remaining members, according to the number of shares held. One of the most ardent advocates of Friendly Societies was the Rev’d. J T Becher (of Thurgarton Hundred Workhouse fame). He had no faith in the ability of the working people to conduct their own affairs though, so would probably not have approved of the Woodborough Society, which was run by the stockingers themselves. However, some members might well have ended their days in his workhouse! Note: If anyone has photographs that can be attributed to the Woodborough Society, please email us with details. 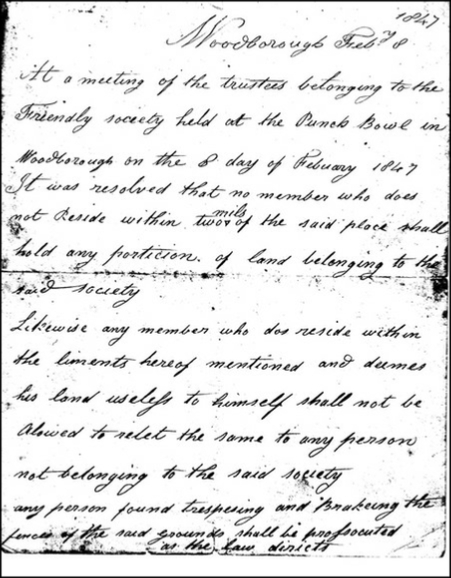 Transcription of the minutes left: At a meeting of the trustees belonging to the Friendly society held at the Punch Bowl in Woodborough on the 8th day of February 1847 it was resolved that no member who does not reside within two miles of the said place shall hold any portion of the land belonging to the said society. Likewise, any member who does reside within the limits hereof mentioned and deems his land useless to himself shall not be allowed to re-let the same to any person not belonging to the said society. Any person found trespassing and breaking the fences of the said grounds shall be prosecuted as the law directs. In the 1870's when the membership was very high market gardening was developing as a second occupation. When Sir Joseph Paxton introduced his strawberry in 1875, the strawberry was brought to Woodborough by a man named John Plumb (who was not a stockinger). It is said that this man who first grew strawberries in Woodborough carried a square containing 12 lbs under each arm to Nottingham and sold them in the Poultry at 1/- (one shilling) a pound. The result of this was that the stockingers found that from the allotments they had got from the Friendly Society for the purpose of feeding a pig and keeping the family, they could in fact grow strawberries and soon these were grown in very considerable quantity, though in small pieces individually. The first people to sell strawberries in Nottingham in the retail market were perhaps the stockingers of Woodborough, who sold them in the Poultry between the Council House and the Flying Horse Hotel.